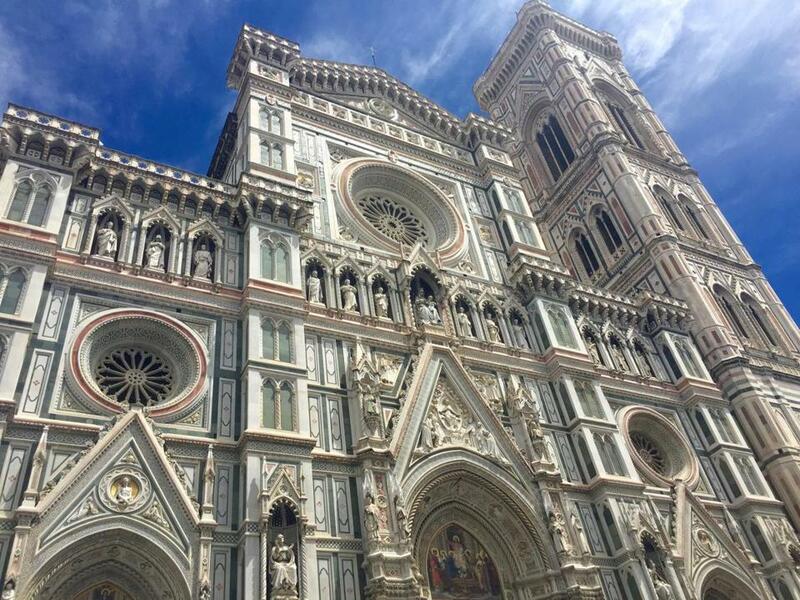 The stunning Dome of Florence Cathedral is the main church of Florence. It was a scene of melee. The crowded sidewalk beside the canal was three deep with people struggling to stay near the tour guides channeling visitors into the waiting gondolas. Inching toward the wrought iron fence that kept the masses from spilling into the canal, we waited to embark on the 30-minute ride that was included as part of our Venice walking tour. Despite the appreciable chaos, it was only a moment before we were stepping into the black lacquered craft. Our gondolier navigated expertly through the phalanx of gondolas and into the narrow canal that was not unlike I-93 at rush hour. “Is it possible to get away from this hullaballoo?” I asked, struggling to produce the Italian word for hullaballoo. Marco flashed a broad grin from beneath his straw fedora. He apologized with a smile. This was the only way. As anyone knows who has visited Italy at the height of the tourist season, July promises heat and crowds that require a good deal of stamina from even the savviest travelers. A month long, multigenerational Italian adventure meant some advance planning was essential. On my first trip across the pond over 20 years ago, I headed out, like most twentysomethings, armed with a giant backpack and a well-loved copy of “Let’s Go Europe.” I had no reservations and only a vague itinerary — the most enticing chapters in my book and the Eurail schedule tucked into my journal would determine my path. My husband’s early travels were equally intrepid. But one thing was absolute — we never joined any guided tours. Flash forward to summer 2016. My husband and I had spent ample time in Italy before our three daughters were born, but now the travel picture looked quite a bit different. There would be no packed hostels with shared, coin-operated showers or smoke-filled, second-class train compartments. Instead, we swapped our youthful exploits for a neat itinerary that included tours of several of Italy’s most touristed sites. Expert-led visits to places like the Vatican, the Colosseum, and the Uffizi Galleries would make them far easier — and more interesting — to navigate. As we boarded our flight, we were resigned to being tourists rather than travelers for the first time — or so we believed. First on the docket were three days in Rome, a mere blip in a place requiring a lifetime to digest. In Vatican City we found Francesco, our LivItaly guide, waiting for us in a tiny pocket of shade across from the museum. All of humanity packed the surrounding streets and the queue stretching from the entrance appeared endless, but Francesco whisked us right inside — front of the line access was a welcome perk. Our Vatican treasure hunt lead us to areas of the museum kids find most interesting and our girls delighted in strolling past carriages used by various Popes, figuring out how many serpents encircled the bodies of Laocoön and his sons in the Octagonal Court, and locating familiar towns in the Gallery of Maps. Later, in Saint Peter’s Basilica, our 12-year-old daughter stood transfixed by Michelangelo’s Pieta, immune to the jostling masses surrounding her, as I had done years earlier. Our days in Rome were accompanied by a sweltering weather pattern the Italians refer to as l’afa — literally a suffocating heat — which already shimmered up from the streets early the next morning. We met Valeria, our docent from Context Travel, outside the Colosseum for an Ancient Rome Discovery Tour. Valeria launched her gory, yet fascinating, tale of the famous amphitheater as she led us through the turnstiles and her storytelling brought to life savage beasts, disgraced criminals, and tortured gladiators as we overlooked the stage where the bloody games once occurred. Walking amidst the ruins in the Roman Forum was even more surreal and we pondered together what other wonders could be buried beneath that Eternal City. Not far from the funeral pyre where Julius Caesar was cremated, our wilting daughters filled their empty bottles with fresh, icy water flowing from an iron spout. I’d forgotten about the nasoni scattered throughout the city — our youngest was on a personal quest to drink from each one — and we were beholden the Romans for creating the extensive system of aqueducts springing from the days of antiquity. By this time, despite our affection for spontaneity, my husband and I were both grateful for the amount of mental and logistical effort the tours had saved us. In the company of our guides, we were able to immerse ourselves in Italian history and culture alongside our kids instead of having to deal with the usual parenting responsibilities of tickets, lines, and guidebooks. In the weeks that followed we wandered through Florence and searched for Cellini’s hidden face on the head of his statue of Perseus, learned about chiaroscuro from Leonardo’s beautiful Annunciation, and wondered whether or not David had slain the giant before or after the moment captured in Michelangelo’s masterpiece. We strolled beneath trees heavily laden with golden lemons on the Amalfi Coast, sampled wild boar at a medieval festival in an ancient Tuscan castello, and broke bread with our extended Neapolitan family, whom our girls were meeting for the first time. All the while, in spite of the initial skepticism, flashes of serendipity sprouted from our tightly knit plans. And then in Venice we did the thing we always swore we’d never do. The thing we always considered the hokiest of hokey tourist stuff ever. Marco planted his foot against the wall of the ancient palazzo, pushing the gondola along the passage into the Grand Canal. All around us were the churning motors of the vaporetti, the whines of the water taxis, the chugs of the mail boats. Modern Venice went about its business as Marco kept up a steady stream of banter with his stripe-shirted colleague rowing beside us. Our girls, perched on the red wooden seats, stared everywhere in wonder, drinking in the elaborate, Gothic arches decorating the buildings that lined the canal as small waves churned up by the ferries slapped the side of our boat. Once too sophisticated for such nonsense, my husband and I were equally entranced by Venice’s captivating spirit and the joy of experiencing it with our daughters. Yes, the travel picture was now quite different. But we loved this new image of Italy our trip had painted. Guided tours abound in Italy, both in the cities and the countryside. Here are those we experienced. All offer both private and small group tours and a personalized experience.